It’s big but is it a record holder? A Stockton pub is issuing a tasty challenge to anyone who likes food: Come and take on the Zeus, possibly the tallest burger in the UK. The George, on Stockton’s high street, introduced the calorie-busting Zeus burger challenge, where customers will get the 11-inch burger for free – if they can finish it in under 15 minutes. 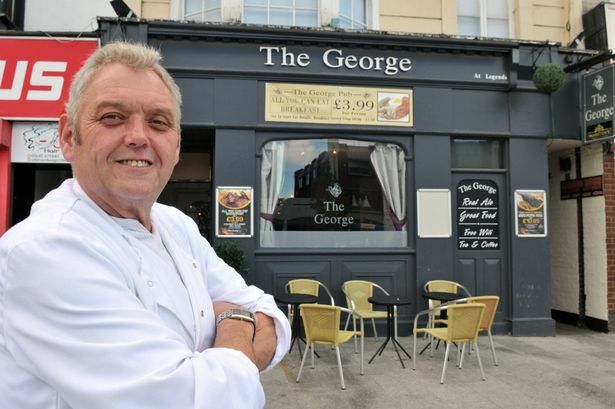 The pub has been run by Graham Harker and his son Craig since August and they were inspired to create a mountain of food for customers to overcome by TV show Man v Food. The £16.95 burger is made up of three beefburgers, two chicken breasts, a parmo burger, six slices of bacon, onion rings and a pork frickadella. It is smeared in melted cheese and comes with fries and coleslaw. To beat the challenge, contestants need to eat the burger in under 15 minutes for a full refund but if they manage it in less than 20, they’ll receive a free T-shirt. Graham was inspired to include elements of his own life in the burger. Born in Stockton in 1958, he spent time in the British Army and served in Germany. He returned home and has owned businesses in Stockton including a convenience store and a shop selling German food. Graham said: “I have cooked all my life but never had any official training. I wanted to incorporate things like the frickadella in to the burger that would make it different from anything else. “We’ve had quite a few people come and try it but so far no one has done it within the time limit. The father and son duo reopened the pub last month. They have already seen a great response after offering a £1 parmo every Monday. As they brought out the giant Zeus burger, my stomach sank. I’d heard of foot-long sarnies but this was ridiculous. It was Man v Food, Teesside style, and food definitely won. When I was approached with the challenge, 5lbs worth of delicious burger didn’t sound too bad. I had seen Man v Food star Adam Richman take on much bigger challenges than this and I’ve got a hefty appetite. I was Hercules and this Greek God was going down. But the Zeus was no mere food challenge. It was no normal burger. 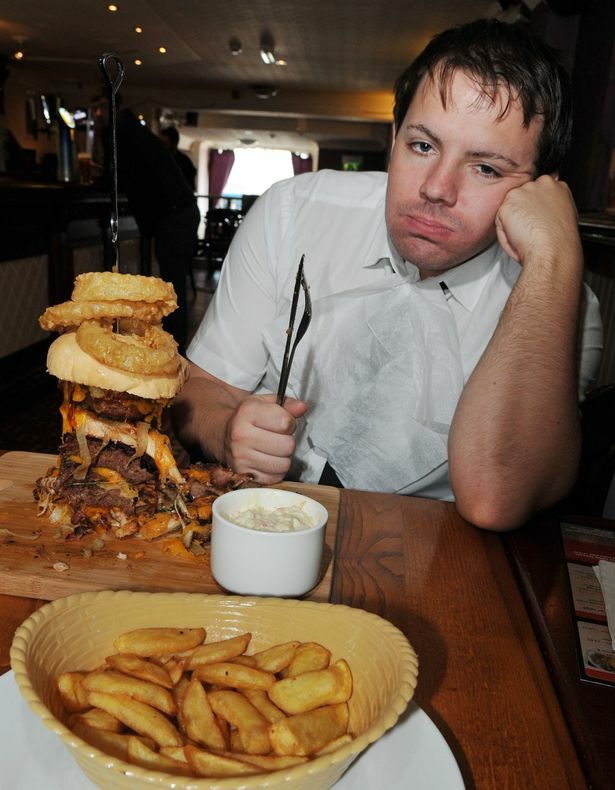 Possibly the tallest burger in the UK looked like a molehill when The George staff first served it but with each tasty bite, it grew into a mountain. My 15 minutes were up before I’d even made my mark. Soon, the chance for a T-shirt was gone and so was my appetite. Even half of this behemoth would be enough to leave a normal belly stuffed. With little more than half gone, I found I could eat no more. I had tried to take on the Zeus burger challenge and had failed miserably. The leftover burger taunted me as I left The George, tail between my legs. The Zeus burger had been my Mount Olympus and I couldn’t even climb half way. Man was beaten by the burger.